Top Left: Palestinian Youth And Israeli Police Clash In Jerusalem. JERUSALEM, ISRAEL - NOVEMBER 06, 2014: Palestinian youth clash with police at Shuafat refugee camp a day after a Palestinian resident of the camp was named as the driver of a van that rammed into a crowd at a rail stop. Clashes started at the refugee camp following the attack in which one person was killed and at least 13 people were wounded after a driver crashed into pedestrians during a suspected terror attack near East Jerusalem. Top Middle: Rebel Fighter in Syria. ARBEEN, SYRIA - JANUARY 29, 2016: A rebel fighter, reportedly belonging to the Faylaq al-Rahman brigade, looks up from his hiding spot in the rebel-controlled area of Arbeen, on the outskirts of the Syrian capital, Damascus. Top Right: Migrants Cross into Slovenia. RIGONCE, SLOVENIA - OCTOBER 26, 2015: Migrants are escorted by police through fields towards a holding camp in the village of Dobova in Rigonce, Slovenia. Thousands of migrants marched across the border between Croatia into Slovenia as authorities intensified their efforts to attempt to cope with Europe's largest migration of people since World War II. Bottom Left: Mourning Victim of Islamic State Suicide Bombing. HASAKEH, SYRIA – DECEMBER 13, 2015: The sister (L) of Mohammed Ismael, who died in one of three suicide car bombings claimed by the Islamic State (IS) group in the nearby town of Tal Tamr, mourns during his funeral in Qamishli, a Kurdish-majority city in Syria's northeastern Hasakeh province. Tal Tamr, in the Khabur region, is controlled by Kurdish forces and has been targeted in the past by IS jihadists, who in February 2015 overran much of Khabur and kidnapped at least 220 Assyrian Christians. 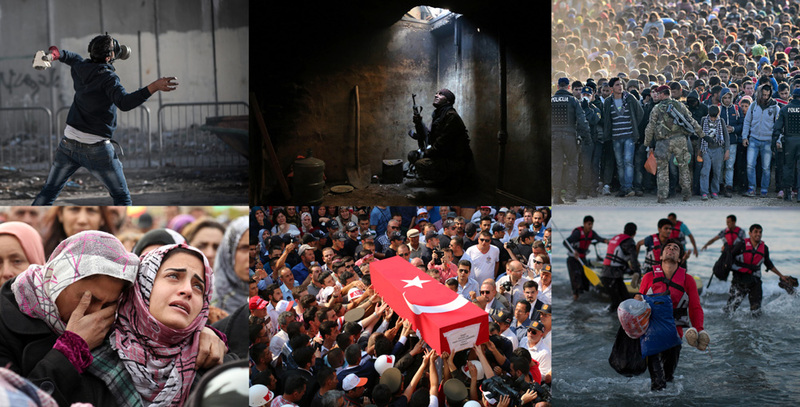 Bottom Middle: Funeral Ceremony of Turkish Soldier Killed in Terrorist Attack. DENIZLI, TURKEY – JULY 31, 2015: People carry the coffin of Infantry Kagan Kandemir, one of three Turkish soldiers who was killed in a terror attack on a team of troops in Sirnak, during a funeral cortege in Denizli, Turkey. Bottom Right: Migrants Begin Their Journey Through Europe. KOS, GREECE - AUGUST 31, 2015: Migrants from Pakistan land on shore after completing a journey in a small dinghy crossing a three-mile stretch of the Aegean Sea from Turkey to Kos, Greece. Migrants from many parts of the Middle East and African nations continue to flood into Europe before heading from Athens, north to the Macedonian border. Since the beginning of 2015 the number of migrants using the so-called “Balkans route” has exploded with migrants arriving in Greece from Turkey and then traveling on through Macedonia and Serbia before entering the EU via Hungary. The number of people leaving their homes in war torn countries such as Syria, marks the largest migration of people since World War II. Violent conflict constitutes the defining foreign policy challenge of our time. The Pearson Institute for the Study and Resolution of Global Conflicts and The Pearson Global Forum are examining societies and people fractured by conflict. We are asking empirically relevant questions. We are employing rigorous research methodologies. And by collaborating with partners and policymakers, we can inform public policy. Our goal is simple but ambitious: to reduce human suffering and create a world more at peace. UNRWA Humanitarian Distributions in Yarmouk. 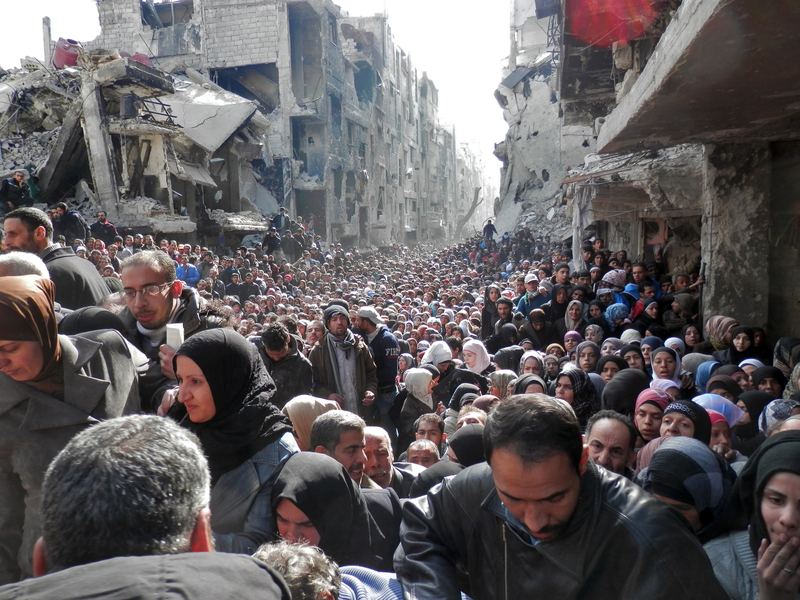 DAMASCUS, SYRIA ‐ JANUARY 31, 2014: Residents wait in line to receive food aid distributed in the Yarmouk refugee camp in Damascus, Syria. The United Nations renewed calls for the Syria regime and rebels to allow food and medical aid into the Palestinian camp of Yarmouk. An estimated 18,000 people were besieged inside the camp as the conflict in Syria continued. Deaths by terrorism increased annually between 2008 and 2016, from 8,455 to 32,715. 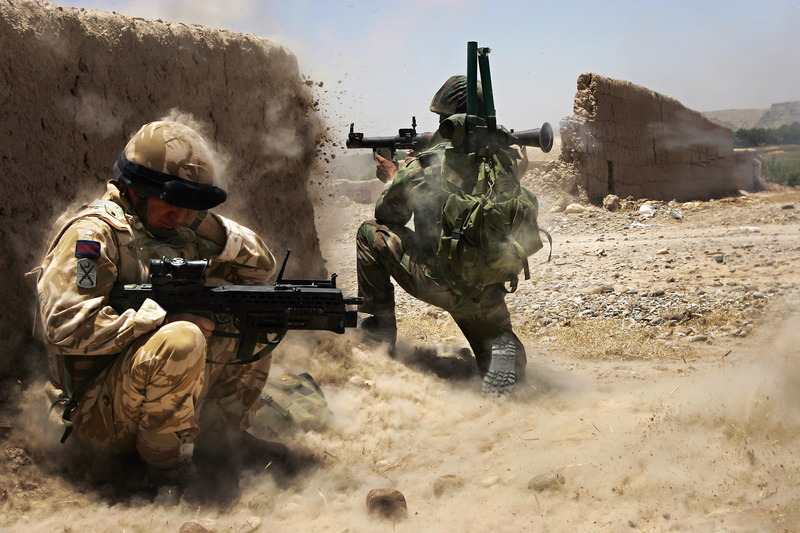 HELMAND PROVINCE, AFGHANISTAN - JULY 07, 2007: A British Army officer mentoring Afghan forces crouches behind a mud wall and covers one ear as an Afghan National Army soldier fires an RPG (Rocket Propelled Grenade) at a Taliban position in Kajaki, a village in Helmand Province, in southern Afghanistan. The economic impact of violence on the global economy in 2016 was $13.6 trillion, or 13.3 percent of world GDP and 11 times global foreign direct investment. 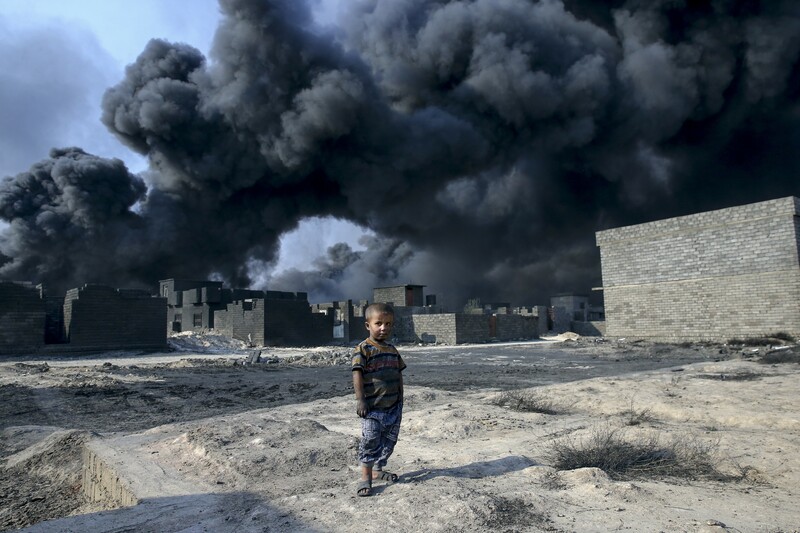 MOSUL, IRAQ - OCTOBER 25, 2016: Children are seen on the street as smoke rises from oil wells, which were set on fire by Daesh terrorists to limit coalition forces pilots’ eyesight and to put the wells out of service. This followed the Iraqi army’s retaking of the town of Al Qayyarah from Daesh. The black smoke badly affected human life. 65.3 million people around the world have been forced from home. Nearly 21.3 million are refugees, and over half of those are under age 18. On the Frontline of the Migrant Crisis. MYTELENE, GREECE - MARCH 9, 2016: A small Syrian girl looks on during sunrise after arriving on an inflatable boat with other refugees, crossing the sea from Turkey to Lesbos, some five kilometers south of the capital of the island, Mytelene, Greece. 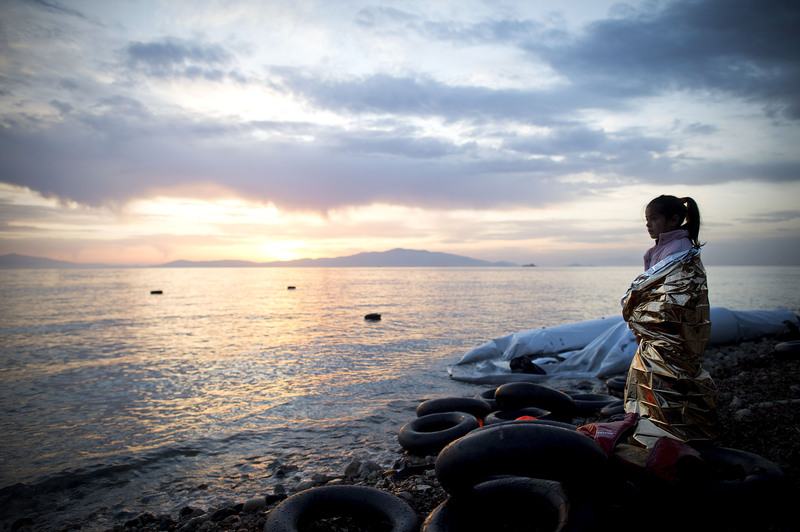 During the night six inflatable boats reached the beaches of Lesbos. The same day, Turkey announced its plan to take back illegal migrants from Syria and to exchange those with legal migrants. We invite you to join with us as we work to reduce human suffering and inform policies that help create a world more at peace. Read about The Pearson Institute’s mission, history, and leadership. Explore degree options and The Pearson Institute curriculum. Learn about our approach to evidence-based research.